In my efforts to create inexpensive centerpieces I have started studying the roadsides a little more closely. 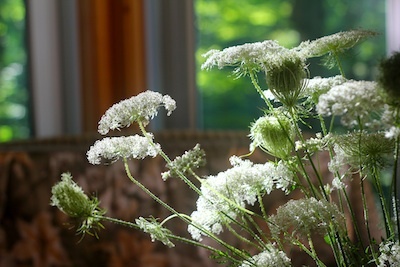 I had always considered Queen Anne's Lace just a weed. But I stopped on my way home from work and picked an armful, brought them home and made a quick, informal arrangement. We love it and how the rising sun filtered through the trees highlights it. 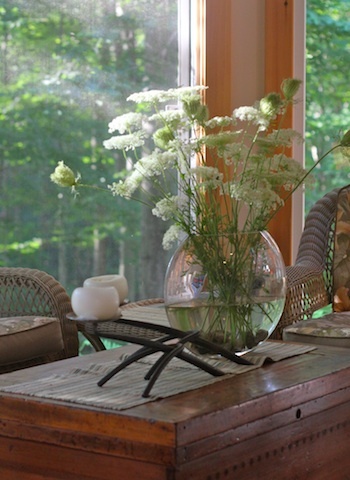 It adds a touch of simple yet wild elegance to our sunroom. 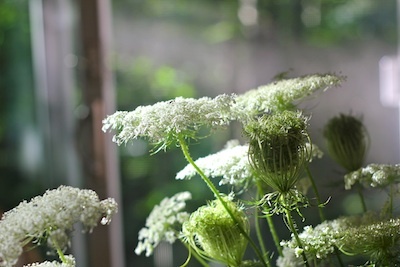 The delicacy of the blooms make a different statement than brightly colored flowers. What a sight to enjoy breakfast with in the morning!